I have a small table with one flower pot on it. It has a couple strawberry plants which grew one strawberry. It no doubt needs more room to spread out. I also put one left over stringbean seed in there which grew and produced a few stringbeans. Too late this year, next year I’ll use a bigger pot and put less in it. A pot on a small table like that is nice near a chair. 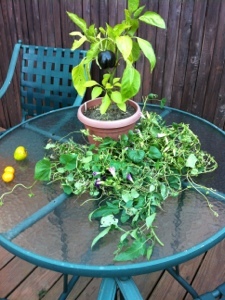 Although it didn’t produce much fruit, the long strawberry vines looked nice falling off the table’s edges.